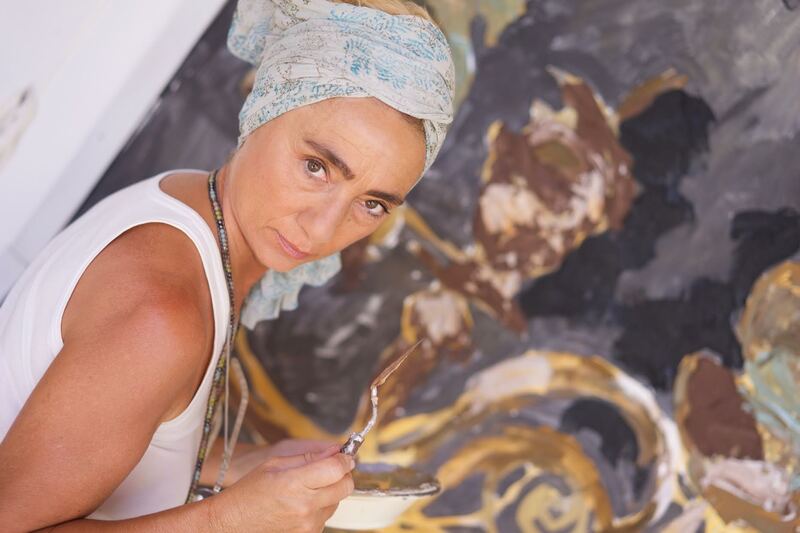 Here is my candid interview with world renowned Spaniard painter Pepa Poch at her recent Dragonflies New York gathering. What was on the menu ? Don't worry about it. She said "The ultimate luxury will be to one day only nurture ourselves from the taste of flowers." Because I can't do anything else. I was born an artist, I learnt how to paint before I could read or write. Everyone was born for a reason. Just like you Bisila, you came into this world to bring people together. I was born to paint. It's what I love, my way of bringing to life everything inside of me. How would you describe yourself, what makes Pepa Poch special ? I am a genius, a real genius at that because I don't copy anyone. My inspiration does not come from other people or artists. What I have is my cultural foundation since I was born. I am committed not to fail my audience with repetition with my work. Elegance is the basis of everything. It ranges from your bathroom or kitchen to your most intimate self. It is a way of life, a rule. What does the Pepa Poch world look like, any planet you move to outside of it ? If I could, I'd explore the whole universe, and go from one planet to the next. I wouldn't leave any behind. My world is full of beauty, color and flavor connected to the soul! I introduced my work here through The Incubator of Art with a show at the Clemente Soto Velez Cultural and Educational Center. This is my third act, but this time is more unyielding. People prepare for years, and since I have been getting ready for it, this act feels the most appropriate. I did not come to stay, I came to share and also bring together America and the Mediterranean. I would consider myself like Columbus and the statue of liberty. In my case I would be Lady Liberty, one who shares her light with New York City and to the American world. The Dragonflies Dinners consist of moving my Spain-based studio, atelier and custom made tableware around the globe. I invite my guests in a very intimate setting to eat from my plates and be surrounded by my art. What historical character would you invite to one of your dinners ? I would love to invite Coco Chanel. What food would be essential for you? A carrot straight from the ground. What is your favorite flower ? The basis. Without love, there is nothing. Without love, there is no vase on the table, there are no smiles. How do you perceive your parents ? I see my father as my teacher, mother as a grand dame. What makes an elegant man for you ? A man who knows how to love, a giver. He doesn't have to wear the fanciest clothes,but be of great company. What is an essential piece of clothing for you? A nice piece of fabric like a scarf. A black stone from Lanzarote Island in the Canary Islands. All of them! Libraries for me are everything. I'm all about the aesthetics. For me reading start with wonderful magazines such as Harper's Bazaar. Africa, a lot. I am also passionate about Italy. New York of course, it's the center of the world and my beloved Barcelona and Catalonia, the center of MY world. Light and another way to look at things. We tend to always focus on the same things, our self-interest.